Looking for a new coffee table? Can’t live without a computer? I have a web site for you – something that will definitely make your mouth water and will keep you up all night trying to think of ways to get your hands on what they have to offer. Retro-Tech is a British company that specializes in computer tables. They have been in the business for the past 10 years, and have made quite a name for themselves. What caught my interest is their Platinum Coffee Table. Yeah, just because it is called a coffee table, it doesn’t mean you HAVE TO use it while enjoying your favorite drink (and we all know what that is!). Then again, if you are anything like me, you’d always have a cup of coffee while fiddling with your computer. In the morning, I spend several hours writing. I go through a mug or two of coffee. When I come home at night, I surf the net or play a game. A cup of coffee is the perfect companion. Same thing during the weekend when I catch up on some writing work during the day – coffee is never far from me. 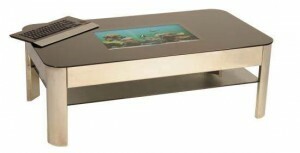 Now imagine having this Platinum Coffee Table which has a built in computer! It has a 22-inch LCD monitor and an Intel Dual Core Processor. It also serves as a hub – it can connect to other gadgets in your living room! I can just see myself never leaving the couch if I had this table right in front me. Now where can I get $5,000?